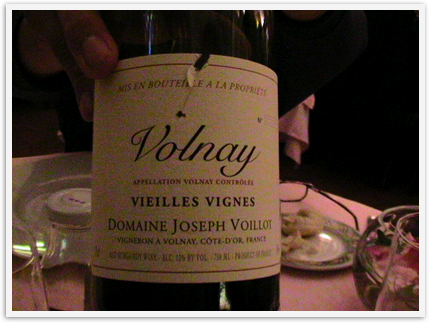 “...This is Burgundy” the waitress said as she poured the very palatable local red wine which brought a smile to our lips. Ahhh,indeed. The only red grape grown in all of Burgundy is the Pinot Noir (which we have become very fond of sinse planting and nurturing our own). 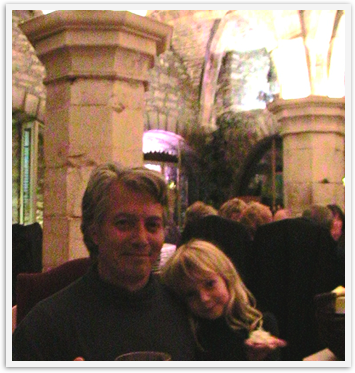 The highlight of our first day in Burgundy was a spectacular and resplendent restaurant called La Dame d’Aquitaine . We were looking for another one, but the beauty and uniqueness of this restaurant caught our eye and we decided to take a chance on trying some Burgundy specialties there. 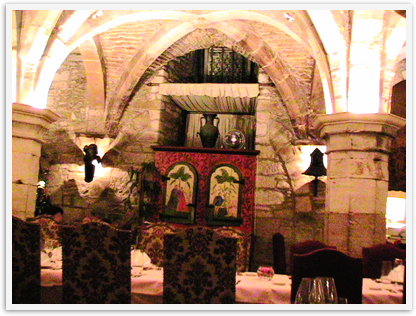 It was located in a thirteen century crypt in the heart of Dijon opposite Eglise St. Jean with an excellent selection of famous and not so famous burgundies. 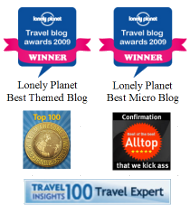 It was one of those memorable traveling moments just meant to be. we will always remember. DaVinci kept exclaiming that his chicken (cooked in the local wine) was the best he ever had in his life. My salmon was divine (tho I never would have thought about cooking it in red wine before). We could not get Mozart to try the escargot, but we ooohed and aaahed over them as we were not about to pass this favorite of ours by since it is another thing Dijon is famous for. 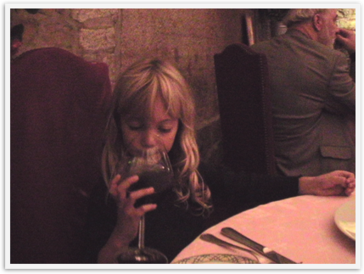 The wine had a marvelous fruity bouquet and luscious taste and Mozart even had her gigantic wine glass filled with a similar looking liquid that was delicious and appropriate (cassis/berry fruit nectar) that she loved. 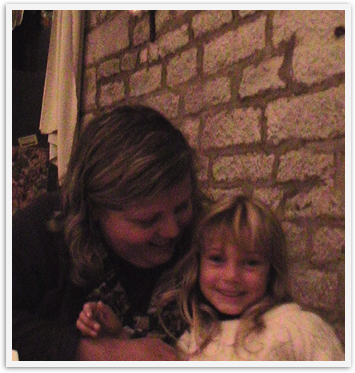 They made a special pasta for her as well that she ate right up as she was the only child in the restaurant. She might not have tasted the escargot this time,but she enjoyed playing with the paraphernalia that comes with snails in their shells and tried the flavored butter on her bread. 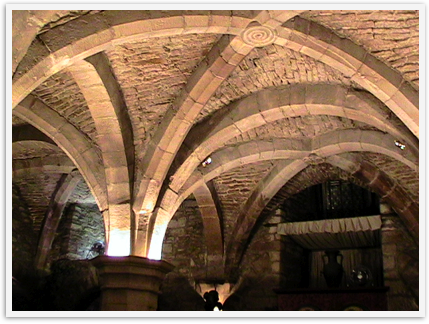 First we loved the looks of the place and it reminded us of another special night we spent at an abbey from a similar century the last time we were in France. You just do not see gorgeous arched ceilings like this in America and the ancient symmetry of it was somehow very calming and pleasing as we entered, perhaps because it was used as a chapel long ago. You can not tell by the pictures, but the lights were actual pieces of head armor from the time of the crusades. There were tapestries on the stone walls and stained glass. Even the bathroom was great with little Romeo and Juliet windows and only the French would think of a machine that would moisten the tissue paper. 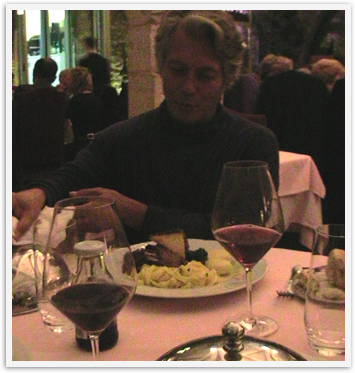 Then on top of all the beauty to please the eyes, the service was superb, the food and wine exceptional. We were three very happy campers as we headed home in our taxi. or less on dinner for all of us, so we feel fine about our splurges, especially when they are as good as this choice turned out to be. This one gets our highest rating and it is so satisfying when a splurge is even more rewarding than the money spent. What glorious fortuity to come upon this gem, especially after our semi hard day. It started out fine as we enjoyed our long walk along the river and watching some kids practice kayaking and the RV camp location is superb right next to a river and lake within walking distance to the center of town, but dealing with the internet connection was daunting at best. But then that is a whole other story.